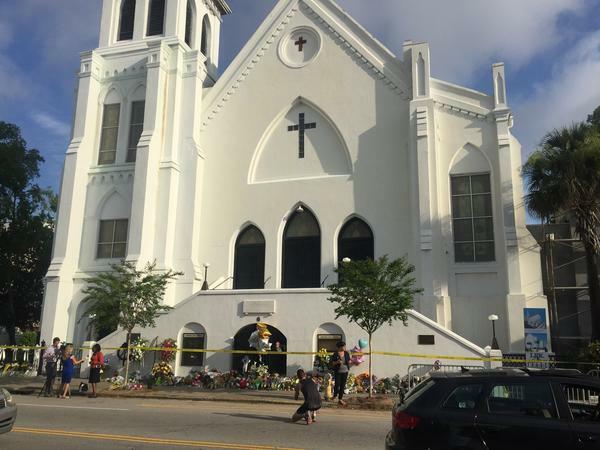 It's been nearly a year since a mass shooting at an historic black church in Charleston shocked the nation. NIKKI HALEY: We woke up today, and the heart and soul of South Carolina was broken. MONTAGNE: That was Governor Nikki Haley the morning after a gunman killed nine worshippers in what authorities described as a race-based attack. Now a 22-year-old white man awaits trial for those murders. And Charleston is working on healing. NPR's Debbie Elliott reports. DEBBIE ELLIOTT, BYLINE: A year ago, officials struggled to make sense of the crime that unfolded on Wednesday evening, June 17, during an intimate Bible study at Emanuel AME Church. Here's Charleston Police Chief Gregory Mullen at the first news conference late that night. GREGORY MULLEN: This is a tragedy that no community should have to experience. It is senseless. And it is unfathomable that somebody in today's society would walk into a church when people are having a prayer meeting and take their lives. ELLIOTT: Nine lives, including the pastor of Emanuel, the Rev. Clementa Pinckney, who was also a South Carolina state senator. His wife Jennifer and one of their small girls were in the church but not in the Bible study and heard the gunshots from another room. Mrs. Pinckney declined an interview. But in an appearance at Duke University earlier this year, she spoke of how hard it's been since. 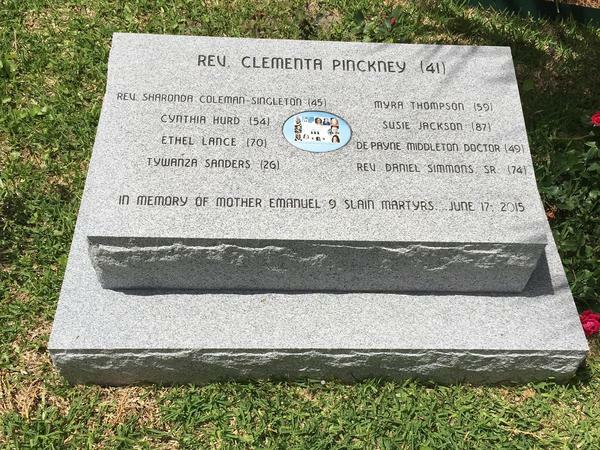 JENNIFER PINCKNEY: There's not a day that goes by that I don't think about Clementa. It's not a day that goes by that our daughters - the daughters - they don't think about their father. ELLIOTT: She lives in Columbia, the state capital, and has started a foundation in her husband's name to carry on his social justice work. She says he was a peaceful person. PINCKNEY: Clementa invited a stranger in. He didn't see color. And even though this violent act happened, I think we all have to put God first. ELLIOTT: Charleston is known as the Holy City. Church steeples dominate the skyline. On Sundays, you hear church bells throughout. 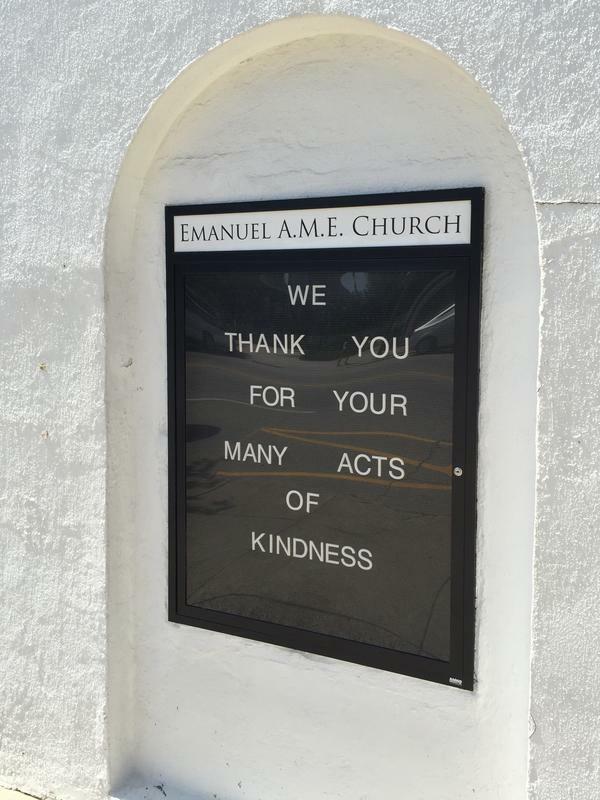 Emanuel African Methodist Episcopal Church started here in the early 1800s and is known as Mother Emanuel, the oldest AME church in the South. KYLON MIDDLETON: In Charleston, religion and churches represent identity. So you attack my church - you attack me. ELLIOTT: The Rev. Kylon Middleton is pastor of Mount Zion AME Church, tucked in a leafy street near the College of Charleston - just a few blocks from Emanuel. From his pastor study, Middleton describes the close ties between the two churches. MIDDLETON: Mount Zion is the actual daughter church of Mother Emmanuel. This church came out of that church in 1887. ELLIOTT: So it's personal, even more so for Middleton. He grew up with Rev. Pinckney. And the two were best friends - like brothers, he says. MIDDLETON: Everything has changed. Nothing is the same. ELLIOTT: He calls the Emanuel mass shooting a targeted terrorist attack that shatters the myth of a post-racial America. MIDDLETON: It has now opened the dialogue for larger, well-meaning, thinking people to see that weight. You know, there are individuals who really systemically have problems with black people by the virtue of the fact that they're black. ELLIOTT: Officials say suspect Dylann Roof had written a white supremacist manifesto online, talking about taking his fight to Historic Charleston because of its significant black population. It included pictures of the blonde young man holding a handgun and waving the Confederate battle flag. Less than a month later, the South Carolina legislature voted to remove that flag from the grounds of the state house - something civil rights activists, including Clementa Pinckney, had sought for decades. Standing in front of Mother Emanuel, the Rev. Joseph Darby with the Charleston NAACP says the massacre here was a defining moment. JOSEPH DARBY: Because of what happened, Charleston will never be the same on many levels. And I don't think America will be the same. It put a horrid and raw face on American racism. ELLIOTT: Darby believes the Emanuel shooting could be a catalyst for social change in much the way that the 1963 Birmingham church bombing was during the civil rights movement. DARBY: South Carolina operates by what I like to call raging politeness. We don't like to bring up anything that's touchy - that might be offensive. And the horrors that happened in Birmingham - the 16th Street bombing, the police dogs, the whole Bull Connor thing - rubbed things raw so that folk had to deal with it. This rubbed things raw. MARGARET SEIDLER: It was a call to action. ELLIOTT: Margaret Seidler is a fifth-generation Charlestonian. SEIDLER: I cannot tell you the number of people - the number of women in particular - that I've grown up with here who say, my eyes are open like they have never been before. My heart is open like it's never been opened before. ELLIOTT: Since the attack, Seidler, a group facilitator, has been working with the police chief to foster a more open dialogue. Charleston has a long and complicated racial history. SEIDLER: We are going back and shining a light on our blind spots as human beings and growing together. And there's a lot of work to be done. ELLIOTT: Mayor John Tecklenburg agrees. He says the grieving continues. JOHN TECKLENBURG: The massacre had a profound impact on our city and on our citizens. ELLIOTT: Now, Tecklenburg says, the challenge is to move the city forward. TECKLENBURG: To try to address long-standing challenges and issues that are rooted in racism and inequity - we don't want to just forgive and forget. We want to forgive and remember the things that are going to lead us to some positive change in our community. ELLIOTT: For Rev. Kylon Middleton, the dialogue started by the tragedy in Charleston can be a lesson for the country. MIDDLETON: Put your gauntlet down and study war no more because, you know, something has to bring us together. ELLIOTT: It will be early next year before suspect Dylann Roof goes on trial for the Mother Emanuel killings. He faces the death penalty on nine state murder counts. The U.S. Justice Department is also seeking a death sentence on federal charges. Debbie Elliott, NPR News, Charleston, S.C. Transcript provided by NPR, Copyright NPR.